When it comes to children and looking after their teeth, getting them into good habits and starting early with dental visits can set them up for a lifetime of good oral health. Feeling apprehensive about a trip to the dentist is not unusual, and in Ireland, it’s estimated that some 60pc of people feel anxious to some degree about dental procedures. But it’s not a fear that parents will necessarily pass onto children, according to Dr Vanessa Creaven. The dentist who is behind Galway practice Quay Dental says that being dental phobic is not innate, but learned, and that parents, from the outset, should set out to make dental visits positive experiences. However, if parents are themselves nervous about the dentist, this can actually have a beneficial impact when it comes to their children. “Often, what we’ll find is the patients who have the biggest phobia, or the real nerves about the dentist, are the ones who will get their children in really early and they’re very proactive about their child’s oral health because they don’t want their children to have what they had,” says Dr Creaven. The dentist advises that a good time to bring young children to the dentist is when parents are going for a check-up themselves. “I always chat with mums who say they could be a bit nervous and they don’t want children to get in the way while they’re having a dental appointment. They feel like the children would be a hassle. I always say absolutely not. The more that you open the dental practice to young children and babies, the more that they’ll actually be grand with it,” she says. 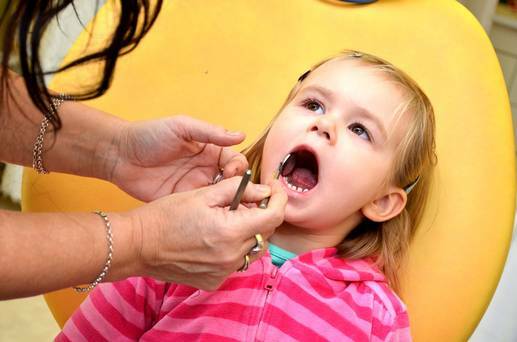 Prevention is always better than treatment and the guidelines in Ireland are that, ideally, babies should have a dental visit when their first tooth comes up, which is normally around seven months. However, if a child has dental pain, she recommends taking them to a paediatric dental practice, which is specially geared towards children. “A check-up is absolutely fine in a normal practice, but if they need a bit of work, it does make a difference if they go somewhere especially designed for them,” she says. There are some foods which parents think are healthy, but in reality, are not so great for teeth. These include fruit juices as well as raisins and dates. The latter two tend to get lodged in the crevices of teeth, which children may not notice, and which then lie for hours on the teeth, causing decay. When it comes to teeth brushing, children don’t have to clean their teeth after meals. In fact, according to Dr Creaven, nobody really needs to clean their teeth after meals and there is a common misperception that the more you brush your teeth, the better. “Ideally, you should be brushing your teeth in the morning and in the evening and two minutes each time. Even as adults, if you’re brushing your teeth three or four times a day, you’re actually putting a lot of trauma on the actual gum tissue around the teeth,” she says, explaining that this can cause gum recession. “For children, just brush in the morning and evening, and in the morning, it can be before breakfast or after breakfast. Until the child is eight or nine years of age, the parents should be brushing their teeth. Under the age of seven, they need mum or dad to give them a hand, because they won’t be able to do it themselves. It’s also important that children use a child’s toothbrush and children’s toothpaste which has less fluoride than the adult version. Flouride, which was introduced to Irish water in the 1960s, is important for fighting decay. However, overexposure to it in the first eight years of life can cause fluorosis and can cause teeth to become mildly discoloured. After the age of eight, it’s fine to move children onto an adult toothpaste. Most important is getting children into the habit of realising how important their teeth are and instilling in them the necessity of looking after their teeth. Also, parents should talk to their dentists. “Engage with your local dentist, touch base with them and ask questions about your children’s teeth. We want kids to come in and we want to get them into the routine of visiting the dentist,” says Dr Creaven.